In 1947, a new serial sailed its way to the airwaves, one quite unlike anything to come before it. High seas intrigue. Colorful, exciting characters, both within the stories and behind the mike. Pulse pounding, pulpy tales of pirates and buccaneers. All of this and more can be found in fifteen-minute punches of action and adventure with Afloat with Henry Morgan, Volume 1. 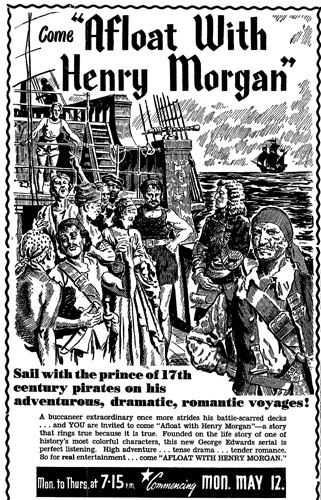 A 52 episode Australian series, some theorize that Afloat with Henry Morgan was likely aimed at younger listeners. Although this might have been the case, this program definitely has an all ages appeal. This is due primarily to the intense pacing of the stories themselves as well as the historical component, the fact that Henry Morgan, the buccaneer spotlighted in Afloat was indeed a real person! Often described as a pirate, Sir Henry Morgan, born according to most biographers around 1635, was actually a privateer. This means that he worked for England, duly papered and licensed to do all he could to engage and combat ships in Spanish employ. His mission quite simply was to fight Spanish fleets, scuttle and sink their crafts, and take whatever booty there might be on the ships he managed to attack as payment for his dedication to the English crown. Spending nearly his entire seafaring career in the Caribbean, wild tales of adventure swirl around the real life Morgan from 1655, his first noted appearance in the area, up until his death in 1688. One of the most intriguing mysteries concerning this hard living, sword-fighting sailor of the seven seas is how he actually came to be in the Caribbean. One particularly dashing story involves Morgan actually being shanghaied and sent on a boat against his will to become an indentured servant in the Americas. When Oliver Cromwell, the then Puritan leader of England, sent an army to the island where Morgan was enslaved, Henry escaped his captors and threw in his lot with Cromwell's army in their battle against the Spanish. Regardless of how he started on his life upon the sea, Morgan definitely made a name for himself, a true terror of the oceans in the eyes of the Spanish fleets and a raucous hero to his own countrymen. Knighted in 1675, Morgan held several government positions on the island of Jamaica, the port he and his escapades are most associated with. Morgan's legend as a carousing, hard fighting ambitious man lived far beyond his death in 1688, providing fertile soil for Afloat with Henry Morgan to sprout from nearly 300 years later. 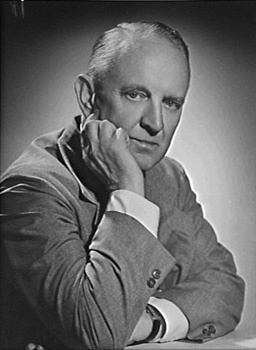 This classic program was produced by well-known Australian radio personality George Edwards. The man behind other Australian series, such as Dr. Jekyll and Mr. Hyde, The Corsican Brothers, and Son of Porthos, Edwards lent not only his production skills to Afloat, but shared his amazing vocal talents as well. Known as "The Man with a Thousand Voices," Edwards parlayed his ability to sound like a young child, any male he wanted to, nearly any nationality necessary, and even older women into a legendary career as a radio actor. The skill to do sometimes twelve different voices in a single episode definitely fit the needs of Afloat with Henry Morgan, with it being a lower budget affair. Afloat with Henry Morgan mined the history of piracy in the Caribbean and the life of Morgan himself for the trappings, if not the actual factual events, needed to bring a rousing tale of rolling waves, blasting flintlocks, and naval warfare to life. Written by Warren Berry, the serial follows Morgan and his intrepid band of privateers through storms, swamps, deep into the hands of the enemy, and of course across the wide open seas. Stories center around political conspiracies, pilfered Aztec necklaces, coups and swordplay, and of course the double crossing and conniving ways of good old fashioned pirates! The first 28 episodes of this cliffhanger non-stop serial are presented in Afloat with Henry Morgan, Volume 1. Restored to the finest sparkling quality possible by Radio Archives, this collection brings you seven hours of history, mystery, hard men, courageous women, and sea battles galore! Thrill as Morgan becomes involved in the theft of an Aztec artifact, plots are hatched and betrayed, raids are planned and double crossed, and a plethora of characters, many voiced by George Edwards, all come together to take you Afloat with Henry Morgan in this first volume of this classic show brought to you by RadioArchives.com. Radio Archives wishes to express its sincere appreciation to Ian Grieve, Australian radio historian, for providing the illustrations seen here, for his assistance in preparing these liner notes, and for helping to make the release of "The Adventures of Marco Polo" possible. George Edwards was truly one of the most talented Actors during the Golden Age of Radio. Australian Radio was fortunate to have had such exceptional programming and the many programs completed by one of the most prolific and talented Actors in Radio History, including, the unique Marco Polo serials, Dr. Jekyll and Mr. Hyde and many others. George Edwards was able to play many of the parts in a particular radio show, and do so without the audience knowing he was playing multiple parts. The Radio Archives staff are to be complimented not only in securing this unique George Edwards serial from Australian Radio, but also in having the radio material transferred from the transcription discs and resulting in exceptional audio fidelity and tonal quality. I have heard many other similar attempts at such radio transfers, and none have yet to compare with the unique quality and selection of material as done through the Radio Archives staff. The incomparable George Edwards does it again!! As a big fan of his Jekkyl & Hyde, Frankenstein and Marco Polo serials, it's a joy to hear the great man doing his stuff again in another complete and perfect quality, exciting serial!! If George Edwards had anything to do with it - it's gotta be a classic! !